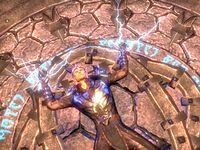 Use the power of the Amulet of Kings to defeat Molag Bal. The time has come to confront Molag Bal and reclaim my soul. Talk to Mannimarco in Heart's Grief. Talk to Abnur Tharn in the Seat of Tyranny. Talk to the surviving Companions. The Prophet will appear to you once you have ended the Planemeld and will call you to the Harborage for the final fight. Go to the Harborage and talk to him. Once you arrive in Coldharbour, talk to Abnur Tharn. Defeat the titan and enter Heart's Grief. Heart's Grief is filled with traitors from various quests, but the central prisoner is your immediate target. Defeat the guardians and torturers, then talk to Mannimarco. "Arrogant, presumptuous, egotistical twaddle! That bit of costume jewelry is nothing compared to the Master's power." "I expect I'll be seeing you soon. My only joy for the rest of eternity will be hearing your tortured screams!" "After all that's transpired? I killed you, you simpleton. I saw your life gutter and fade like a candle flame in a tempest. My undead servants drank your blood and I reanimated your corpse." "Do not taunt me with such hilarity." After you finish talking to him you can choose to free him if you want. You need to press the release mechanism next to him. However, he says you will regret your decision and disappears. Regardless of your decision, Mannimarco cannot be sacrificed to power the Amulet of Kings. 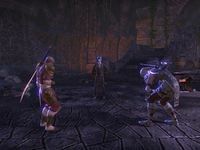 Around the room you will find other servants of Molag Bal whom you are able to free if you so choose; these include the Duchess of Anguish from the Halls of Torment, Prince Naemon and Javad Tharn from the Aldmeri Dominion storyline, Faolchu and Septima Tharn from the Daggerfall Covenant storyline, Aera Earth-Turner and Fildgor Orcthane from the Ebonheart Pact storyline, and Aelif from the Fighters Guild quest chain. Releasing some of them, like Aera, simply kills them and ends their torment, while others, like Aelif, will attack you. Proceed out of the Vestibule and along the Path of Woe to the Seat of Tyranny. Wait for the Companions to assemble in the Seat of Tyranny, then talk to Abnur Tharn. You need to pick which companion to sacrifice: Varen, Lyris or Sai. You can talk to each one, or you can choose to tell the one you want directly. Once you have made your choice, you need to stand on the yellow rune circle and wait for the ritual. The selected sacrifice will give some final speech. The Prophet, for example, will ask Akatosh to forgive him for his hubris. You are surrounded by golden light and lifted into the air for a moment. However, there is no time to lose: you must vanquish Molag Bal. With the power of Akatosh, you burn through the walls of Molag Bal's castle and head up the stairs to the right. 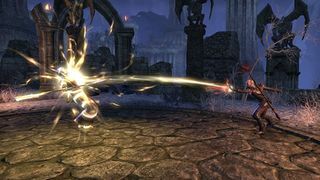 The Daedric Prince summons an army of Dark Seducers, but they are no match for you and a few hits kill them. You burn through more walls, easily defeating daedroths and titans. Molag Bal, standing a hundred feet tall, is visible in the distance, and will taunt you along the way. He will also throw the odd fireball at you, as during The Final Assault, except that they will hit you, doing no real damage. When you come to a chasm, you use one of your new powers, Aedric Command, to reshape the rocks into a bridge. You defeat a group of titans, then prepare for the final battle with Molag Bal. You approach the Daedric Prince. Suddenly, you are lifted up, and Molag Bal starts to crush you in his fist. However, you use the Sacrifice of Courage, which hits him with a fiery beam and causes parts of his face to flake off. Molag Bal, infuriated, lands on your level and begins to fight with you. The arena is a large, flat area with rocky spikes to maneuver around. 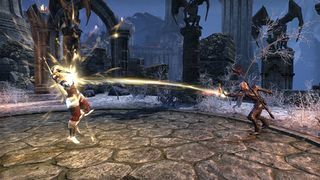 Molag Bal uses a combination of single attacks, which you cannot dodge, an area of effect attack, which occurs after he jumps onto your previous location and lets him dodge attacks, and a breath attack that knocks you over. Once he reaches about half health, he will summon a group of titans, who attack you at the same time as Molag Bal. Once he reaches very low health, he will appear dazed, then teleport in front of you and drop to his knees. You summon a golden two-handed sword and cut him in half at the waist. 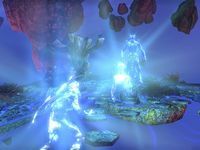 In a flash of light, you are transported to the Colored Rooms, Meridia's realm of Oblivion. At the end of the northern path is a glowing figure—your soul. You reclaim it, and listen to the spirit of Molag Bal. Molag Bal: You have made a powerful ally. Did you know that she would bring you here? What future role has she to play in this grand, cosmic farce, I wonder?" Molag Bal: Bah! Your meddling has already cost me too much, accursed creature of light and flame. This farce no longer amuses me." "Your soul is restored. I can see its light within you. And you have saved your world from a great calamity. But know this, mortal. The forces of Oblivion are legion, and the God of Schemes is but a single player in a complex battle for supremacy." "Your story has only begun. Molag Bal still has plans for you. In many ways, these events played out to his advantage. And you have attracted the attention of the other Daedric Princes, as well." "The war between mortal kingdoms is still ravaging your world, but your true enemies are not mortal. If you are to be prepared for the coming conflicts, you must fully comprehend what is at stake. You must live among those you make war upon." "I have no more desire to keep you here than you had to remain in Coldharbour. I shall return you to your little den in the wild. Your surviving companions await you there. Are you prepared to leave?" She returns you to the Harborage where her gift awaits. Depending on whom you chose to sacrifice, the remaining two survivors will have different dialogue. If you choose to sacrifice Varen, Lyris Titanborn and Sai Sahan tell you that they discussed helping Kasura rebuild the Abbey of the Blades weeks ago. They leave together, confident there will be more adventures to come. If you choose to spare Varen, he chooses to leave and fade into obscurity. Lyris or Sai realizes his or her love for the other but decides to help Kasura. Cadwell calls you over after you finish talking to the Companions. 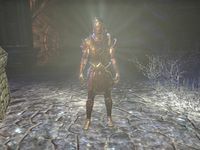 He tells you that he contacted Meridia when you were fighting Molag Bal and that your sacrificed companion will always be with you as their spirit appears near the crystal. He tells you the crystal is Meridia's gift, which allows you to experience the other alliances. Your reward depends on the Companion you decided to sacrifice. If you chose the Prophet, you will receive his restoration staff (The Emperor's Blessing). If you choose Lyris, you get her two handed axe (Great Axe of the Titanborn), and if you choose Sai, you get his two-handed sword (Sword Saint's Blade). All weapon models are unique and are part of the Oblivion's Foe set. After the sacrifice, and until you defeat Molag Bal, you will be shown wearing the Emperor's Regalia. Without becoming Emperor, this is the only time you will be able to see your character in this outfit. Prior to the One Tamriel update's removal of the level caps on the main quest, this quest could not be started until level 45. 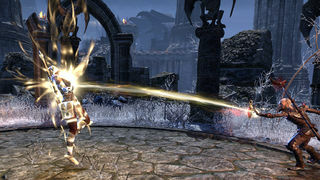 Originally, this quest required a level 50 character, but this was reduced in Patch 1.0.6 to level 45 when Council of the Five Companions was reduced from 45 to 40. I need to travel to the Harborage. I need to talk to Varen Aquilarios before we get underway. Varen Aquilarios has opened a portal to Coldharbour. I should enter it. Molag Bal's most powerful minions stand between us and the gates of Heart's Grief—the fortress of the God of Schemes. We must battle our way inside. Optional Step: Abnur Tharn wants to talk to me. The interior of Molag Bal's fortress seems completely abandoned. We should have a look around. We found Mannimarco's tortured soul. I should speak to him and learn what he knows. We've gotten all we need from Mannimarco. It's time to continue on and face the God of Schemes. Optional Step: I may release Mannimarco if I wish, or leave him to his fate. Molag Bal's audience chamber is near. The only way out is through that chamber. The Five Companions are assembling for the ritual. Abnur Tharn needs to talk to me about the ritual. I must choose the sacrifice that will empower the Amulet of Kings. With the sacrifice chosen, the ritual is underway. I am filled with the power of the Divines! With this righteous, nigh-infinite power, I can challenge Molag Bal and force him to relinquish his grasp upon the world! I have been thrown out of Oblivion into a starry realm of light and color. A voice calls to me from ahead. The God of Schemes withers in defeat, a testament to my awesome power. My soul is ripped from his grasp and awaits my touch. The battle is ended and I have reclaimed that which is most precious to me. The power of the Amulet is expended and it is time to leave. I appear to have been dragged to Meridia's realm of Oblivion. She and Molag Bal exchanged words, and now she stands nearby. I should speak to her. Molag Bal is no longer a foe, it seems, and the future is darker still. I must return to the Harborage. The survivors are taking stock of what happened. Our victory is bittersweet. Molag Bal's Planemeld was stopped and I have reclaimed my soul, but there are darker things on the horizon. I should talk to my companions. Lyris has been spoken with. I should say my farewells to Sai Sahan. Finishes quest Cadwell wants to speak with me. This page was last modified on 9 April 2019, at 05:55.